People wonder why there’s so much pressure during this time of year. Perhaps they need to listen to themselves for a minute or two. Incredible expectations, cramming too many extra responsibilities into an already tight schedule, seeing perfect pictures of families — everyone looking beatific — on Facebook. It’s overwhelming. 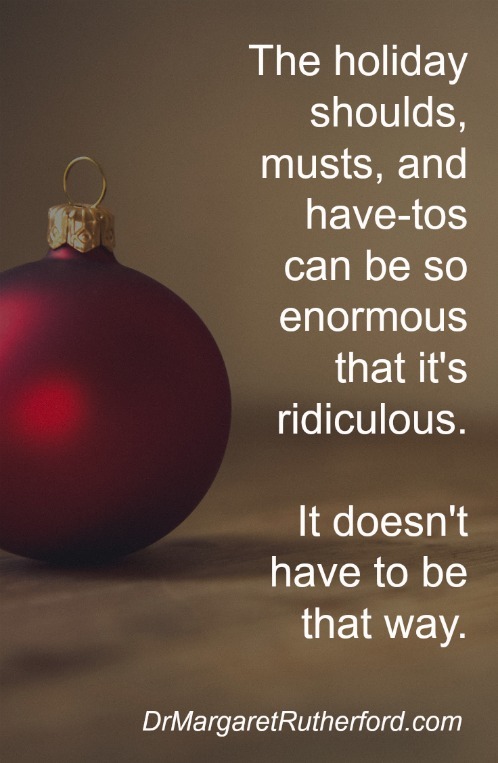 The shoulds, musts, and have-tos can be so enormous that it’s ridiculous. The holidays happen in the context of life. Maybe you found out your spouse is having an affair or you’re getting divorced. Maybe your best friend is dying of cancer. Maybe you’ve got a child crashing on drugs. Maybe your family “does” Christmas, but there’s no joy. Maybe you’re not even in contact with members of your family. Whatever sadness or disappointment exists in your life, before and after the holidays, doesn’t have to be shoved in a box during them, as if it doesn’t exist. That makes it worse. Honoring where you are in life, and where your loved ones are, is vital. I love rituals as much as the next guy. Yet for rituals to retain their fulfillment, you have to want to do them. You’re inspired and rejuvenated by them. You may be emotionally reconnecting with someone who loved you well by carrying on that ritual, or it may be one you created yourself. Maybe this is the year to prioritize — to realize you have options. Five close friends and my in-laws were invited. Would I be able to hold it together? What would they do if I cancelled? I let myself consider the option. That was huge. I’m a pretty responsible type, and calling it off wouldn’t be the norm. But this time, I realized I needed to consider myself. It felt like I was giving myself a gift. I could decide that my grief was more important than the ritual. After a few minutes, I stopped. I remembered what was really important to me. I knew I would feel connected to my parents through ritual. It would bring me joy. I might have to excuse myself if it was too much. That would be okay. So on Christmas day, my rituals soothed me. I choked back tears as I said the same prayer my dad always said. I lovingly used the goblets that graced my mother’s table, swallowing a bit of sorrow with each sip. I can’t remember what my “surprise” dish was — maybe I chose not to make it. Again, keeping my options open. You won’t savor a ritual if you’re enslaved to it. You can decide now which, if any, rituals are important for you to continue this year. Are there new ones you’d like to establish? Is it time to let go of others? Give yourself permission to have options. So much of what we create during the holidays is for others – our children, our parents, our friends — and that is admirable. 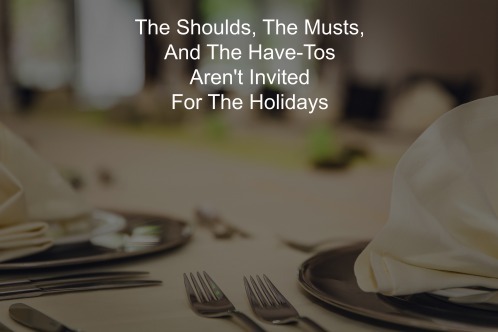 But if you dread going through another holiday season, burdened by the shoulds, musts and have-tos, they will strip you of whatever the holidays can mean to you, given your particular circumstance. Honor your family. Do for others. Honor the rituals. Let them soothe whatever pain you have. Let them bring you and yours comfort and delight. Thanks so much for reading! SUBSCRIBE today and you’ll receive my posts weekly in your email. Plus you’ll get a free copy of my eBook, “Seven Commandments of Good Therapy,” a basic guide to evaluating a therapist.